The story of King Boring kept playing in my head. I imagined that longtime Twelve Mile Circle readers probably already knew I’d have to revisit it in more detail. Plenty of extra information revealed itself on the Intertubes and in genealogy resources. To quickly recap, King Boring and his partner once owned the Detroit Gems, a precursor of the Los Angeles Lakers of the National Basketball Association (NBA). The Los Angeles Lakers currently play in the Staples Center (map), a venue they’ve occupied since 1999. This multi-purpose arena includes enough space for nearly twenty thousand fans when configured for basketball. Games frequently sell-out due to the success of the team. The Lakers have captured sixteen championships during their storied history. I could go on and on, however that would take us down a tangent. The Lakers began in much more humble circumstances as the Detroit Gems of the National Basketball League (NBL). The Gems played only a single season and performed horribly by all accounts. The team finished 4-40. They used the Ferndale High School gymnasium as their home court as the season began. Sparse attendance forced them to move to a smaller venue later in the season, to Holy Redeemer High School with a 1,000 person capacity. They didn’t have to worry about selling out even with tickets costing only $1.50. The original Ferndale High School does not appear to exist anymore. A more contemporary structure bears that name now. However, Holy Redeemer survived the last several decades in Detroit (map) in a neighborhood now known as Mexicantown. The arena at Holy Redeemer provided an interesting contrast to the Staples Center in Los Angeles. The precursor of the Lakers began with humble roots. King Boring and his partner Maury Winston made a bad investment with the Gems. They sold the team for $15,000 after their initial and disastrous 1946 season. The new owner moved the team to Minneapolis where it became the Lakers, named for Minnesota, the "Land of 10,000 Lakes." A later owner moved them to Los Angeles. King Boring (1903-1996) left a long paper trail in his wake, and I found a lot more about him on Ancestry.com. I mentioned the "King" nickname in the previous article. He began his life as Cleo Siple Boring, the son of Illinois farmers Willis Otto Boring and Linna B. Siple. Later, he legally changed his middle name to King (according to the Michigan Death Index) although people generally referred to him as King rather than Cleo. The Boring surname traced back at least to Ralph Bowring of Devon, England (1570-1609). Forbes listed the value of the Los Angeles Lakers as $2.6 billion. Only the most wealthy individuals could afford to own an NBA team today. King Boring did not fit that description. He was just a regular middle-class guy. He worked as an accountant for the City of Dearborn when he formed the Gems and for most of his professional life. Six years earlier the 1940 Census recorded his salary as $2,300 (adjusted for inflation = $40,500). According to the Dearborn Directory, he lived in a modest home at 1020 N. Mildred Street (map) the year the Gems played. His partner, Maury Winston, also came from a middle-class background. He owned Winston Jewelers located at 13502 Michigan Avenue in Dearborn. Winston provided the team its name. He was a jeweler so the team became the Gems. Boring became a beloved figure in Dearborn both for his years of service to the city and for his passion to sports. 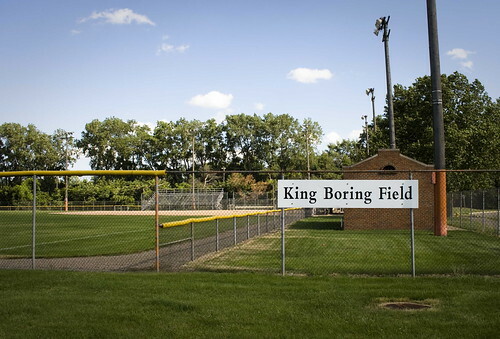 I already mentioned the King Boring Park and Field named in his honor in the previous article. Back in his original hometown in Illinois he became a member of the Salem Community High School Hall of Fame. He also had a Testimonial Dinner in his honor at the Fairlane Club in Dearborn in 1978. The program from that dinner included much more biographical information about the anything-other-than-boring life of King Boring, including his later sports escapades. Clearly people liked and respected him. If only he’d held onto that team.